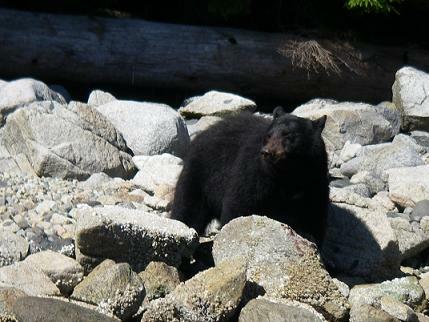 Finding black bears on the beach is a cooperative effort that includes the guests and guide. If you notice the top half of the beach is in a dark shadow and that makes bears hard to spot when you are running the boat and scanning the beach. All the eyes in the boat need to be on the search for black bears to be successful. It may be the guides “job” but we will gladly take all help and are willing to stop to check even if it is occasionally a rock or log because most of the time it is a bear. When you are in a boat surrounded by dolphins the best method for photograph taking is to point, shoot and hope. And some times the result is the “bucket list” photo. 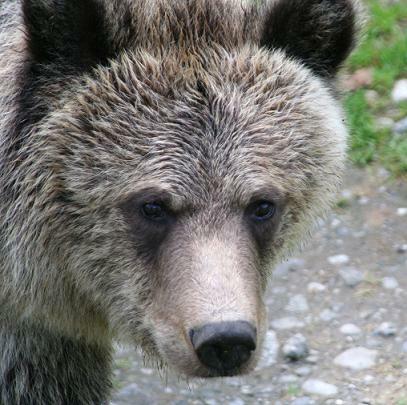 This is the case where the grizzly is doing the spotting. We were in a skiff in the Glendale River estuary on a morning grizzly bear tour from the lodge. The tide was starting to rise so we were just starting to move up the river when this large male grizzly walked out of the sedge grass toward our boat. As the photo shows its head was up and it was on a mission we were just hopping we were not the mission. It passed or skiff about 30 meters (yards) away and paid us little interest it was then we realized it must be smelling the small yacht in the bay cooking bacon for breakfast. The wind must have shifted because it soon returned to eating the sedge grass and rolling rocks. 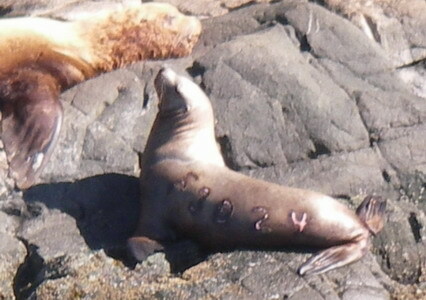 This Steller sea lion was branded at Forrester Island in Southeast Alaska that is the “F” in the brand. Branding occurs at several places along the west coast of North America as part of project to discover the reasons behind the mysterious disappearance of sea lions and what it could mean for the ocean ecosystem. Since 1980, the world population of Steller sea lions (Eumetopias jubatus) has dropped from around 300,000 animals to fewer than 100,000, and it is still declining. Possible causes include increased incidence of parasites and disease, predation by killer whales, nutritional stress through competition with man or other species for food, or nutritional stress caused by natural and/ or human-induced changes in the abundance, quality and distribution of prey. Other factors that may be contributing to the population decline include meteorological changes (i.e., frequency of storms), pollution and toxic substances, entanglement in marine debris, and incidental and intentional take by man. Whether the decline is caused by a single factor or a combination of all of the above is a matter of scientific debate. One of the viewing platforms we use in the fall has a ramp that is covered with a metal cage. 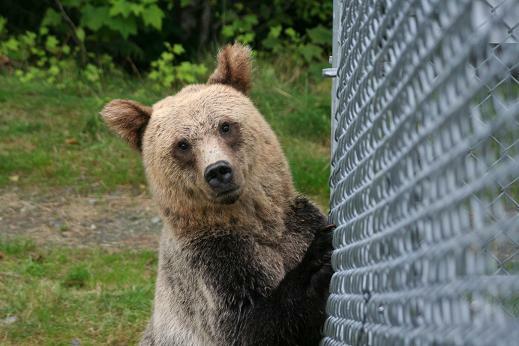 For some reason the juvenile grizzlies use this as a back rub and are curious that we are in the cage and they are free. This is like being in at “zoo” except we are the ones in a cage. Unlike the grizzly is the previous posting killer whales do not get to stay in one place and enjoy the sun. The pod will form a tight group often a line if they are traveling, and their breathing and movements will synchronize. They take several breaths at the surface, and then submerge for a period of time before surfacing again. The time spent submerged increases as the “sleep” becomes deeper, and they may take up to ten breaths near the surface before submerging for as long as ten minutes. It the pod is in search of food it will spread into groups of two or three and this is when the hydrophone will pick up their calls as they communicate. Viewing grizzly bears in the fall after August 25 we travel up the Glendale River and use viewing stands overlooking the river and the entrance to a man-made spawning channel. 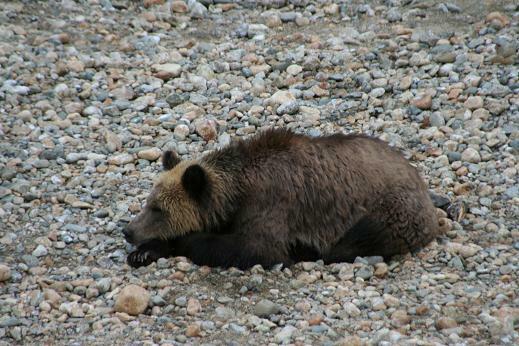 The bears in the area have accepted our presence to the point that they will lie on the beach to dry in the sun or for a short nap. This can also be a break from fishing, which allows the food to settle down / digest and make room for more. Bald eagles are sexually mature at four or five years of age and this is indicated by the fact they now have their white heads. 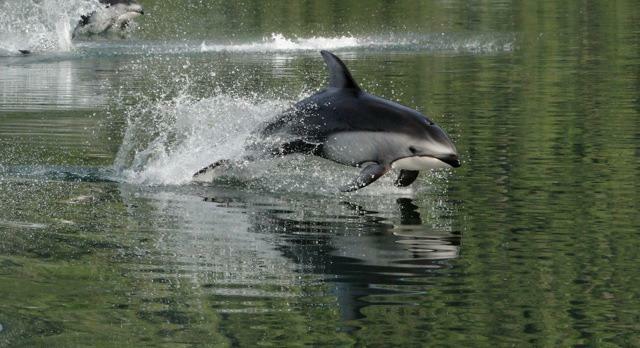 When they are old enough to breed, they often return to the area where they were born. 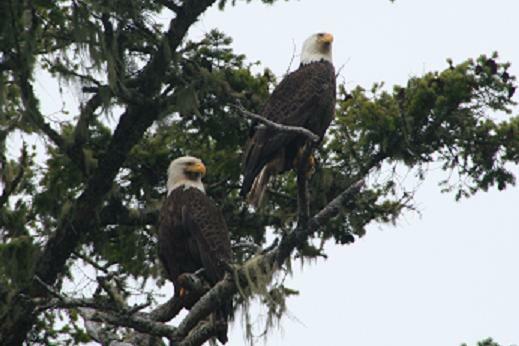 It is thought that bald eagles mate for life and thus when we are running along the shore on tours from Grizzly Bear Lodge if you see one eagle the other will be close. It is not very common to have them in the same tree as it narrows the area for fishing but is does give one a chance to determine which is the female. The female is the larger of a mated pair in this case I think the higher of the two but unless they are side by side on a branch it is hard to tell. This may be the photo of choice for our guests but it is also an interesting photo that reveals much information. First is that this bear is not very hungry because the fish is hanging from its mouth and not moving so it has been dead awhile and not yet eaten. Second is that there are likely allot of salmon in the area and this grizzly is not worried about eating fast and trying to catch another. 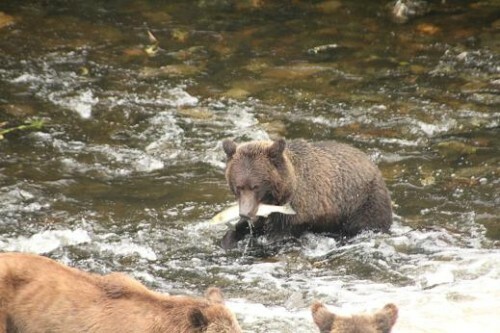 Third that this is not a bear with cubs or they would be close trying for the salmon. Forth that there are other grizzlies close that have this bears attention and they may be a challenge causing it to move off the river. Fifth that the white water indicates that there has been a recent rain causing the river to rise and run a little faster than normal. But our guests are more interested in getting a good photo than the background information until they are explaining the photo to a friend back home. 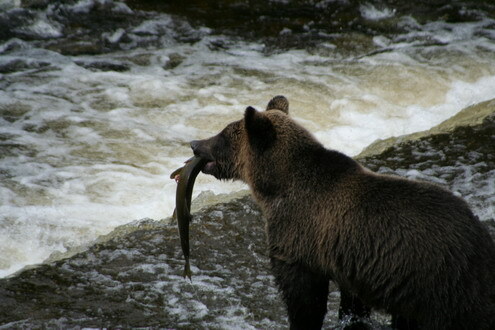 This could be this two-year-old grizzly bear cub’s first salmon. It was the first day that we noticed it had much interest in fishing. Prior to this it relied on it’s mother to provide the food. Time to become an active member of the family and obtain it’s own meals. There is a good chance that this is the last “fishing season” with mother and therefore the last chance to pick up the necessary techniques to survive on it’s own. Females will rear their cubs for 2-3 years. 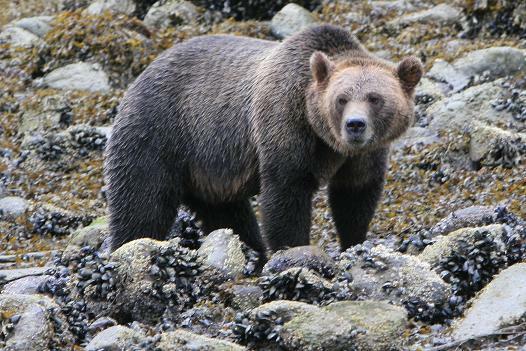 When a female grizzly bear leaves her mother, they often set up their home range in Knight Inlet quite close to their mother’s home range. Males will typically range further, but may also remain close by.